Entertainment industry groups in Norway have spent years lobbying for tougher anti-piracy laws, finally getting their way earlier this month. But with fines and site blocking now on the agenda, an interesting trend has been developing. Quietly behind the scenes music piracy has collapsed to less than a fifth of the level it reached five years ago while movie and TV show downloading has been cut in half. At the start of July a brand new law aimed at reducing online piracy went live in Norway. The product of years of effort, the legislation will allow registered anti-piracy groups to pursue individuals sharing copyrighted content. The law also allows infringing sites to be blocked at the ISP level. Needless to say, The Pirate Bay is at the top of the list but it’s expected that all major torrent sites will become targets in the months to come. Industry lobbying for these changes has taken place over many years, with the Ministry of Culture finally getting down to business a little over two years ago. However, it now becomes apparent that the need for these tough laws has been reducing massively. 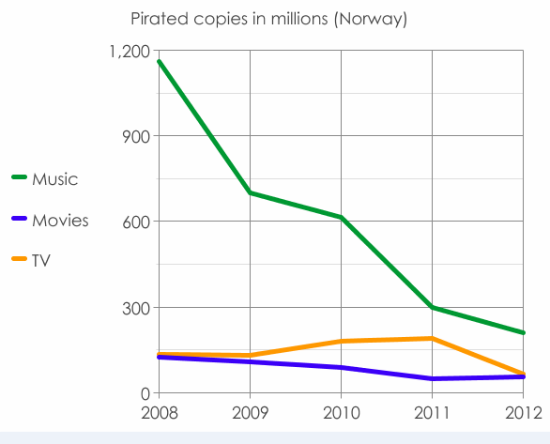 According to a new report published by Ipsos, between 2008 and 2012 piracy of music, movies and TV shows collapsed in Norway. 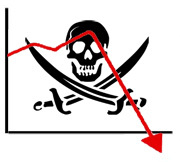 So what is responsible for these significant drops in piracy? First of all this effect cannot be put down to anti-piracy campaigns. Only a tiny number of Norwegian file-sharers have been prosecuted in the past five years and only since July 1st has the law been loosened to allow that position to change. So with scare tactics out of the way we’re left with the common sense approach yielding the best results. “When you have a good legitimate offer, the people will use it,” says Olav Torvund, former law professor at the University of Oslo. The dramatic reduction in audio piracy suggests that the music industry has responded most effectively and that theory is backed up by stats in the report. While TV show piracy has reduced by half in four years, it actually peaked at the start of 2011 with 200 million shows copied without permission. However, since then with the introduction of legal alternatives, unauthorized copying is down more than 72%. For movies the decline has been more steady but with the introduction of Netflix into Norway during October last year, figures for 2013 should be even more encouraging. It’s likely, however, that the entertainment industry will put this year’s successes down to the new law. While that may have an effect it is clearly the legal offerings making the big differences in Norway. c There are 245 comments. Add yours?